Opening hours: Berlin has extremely liberal opening times. Theoretically, shops may stay open from Monday to Saturday round the clock. 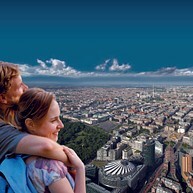 Tourist information: about Berlin is available by calling +49 30 25 00 25, online at www.visitBerlin.de, and in town at the Berlin Tourist Information Centres. Colourful on the outside, tasty on the inside. Experience the unique world of chocolate in a new way. In the heart of Berlin. Near Gendarmenmarkt. In an area covering almost 1,000 m² visitors can freely enjoy, discover and create. In our SchokoCafé you can enjoy our selected menu offerings all about chocolate. Explore the SchokoPfad to learn how our chocolate is created and everything else that you ever want to know about chocolate. At our SchokoKreation you can also create your own personal dream bar from exceptional ingredients, such as gummy bears or pink peppercorns. 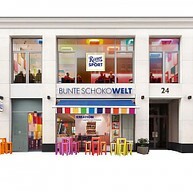 You will find many other RITTER SPORT gift ideas at our SchokoShop. Admission is free. 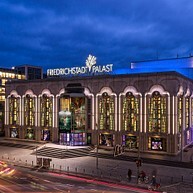 Show entertainment with these unique dimensions cannot be found anywhere else in Europe but at the Palast. Jean Paul Gaultier designed the over 500 daring and extravagant costumes. Recommended by the New York Times as "Must-See in Berlin". Tickets from € 19.80. Also suitable for international guests, who do not speak German. In the heart of Grunewald lies Teufelsberg the highest mountain built from the rubble of the 2nd World War with a fantastic 360° view over Berlin. British and American secret services operated their most important and spectacular spy station here. 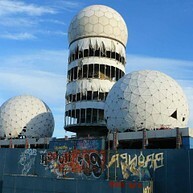 On weekends guided tours through the ruins with high profile street-art galleries are a Berlin highlight. With over 450 exhibits, for the first time ever a museum offers an extensive insight into Dalí’s master ship of almost every technique of art, and does so right in Berlin’s lively centre. Start your trip through this exciting capital city, and its constantly changing aspects. Come on board our ships, and view more than 60 Berlin attractions, including the Reichstag, the government quarter, the House of the Cultures of the World, Bellevue Castle, the "Snake" housing governmental employees, the main railway station, Berlin Cathedral, the Museum Island and the Nikolai district, Berlin's oldest residential area. Learn interesting and educational facts about Berlin's history and architecture, and discover something new on every trip through this dynamic city. The best way to explore Berlin! A fascinating tour at your own pace in our stunning double-decker buses. We offer 3 tours (2x bus & 1x boat) in up to 9 languages. Hop on and off at all the places you'd love to visit with our ticket. 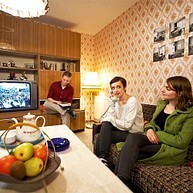 The DDR Museum is Berlin’s interactive museum. You’re taken on a journey into the socialist past, taking a seat in a Trabi, dancing the Lipsi, or rummaging around in an authentic apartment - a hands on experience of history! 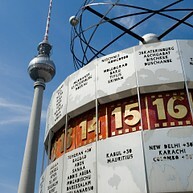 The best views of Berlin: With the fastest elevator in Europe in just 20 seconds to 100m height. Spectacular views of the city’s most famous landmarks and historic sites! The Brandenburg Gate and a lot more are just a stone’s throw away. A unique combination of view, exhibition and café. 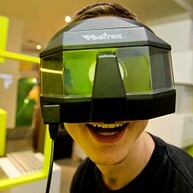 The world's first computer games museum opened in 1997 in Berlin. 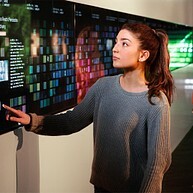 Since January 2011, the museum presents its new permanent exhibition in Berlin's trendy Friedrichshain district. A fascinating exhibition has transformed the historic interior of the former East Berlin cult cafe Warsaw in a pixelated game landscape. The Computer Game Museum is situated right in the middle of the biggest European cultural monument - the Karl-Marx-Allee. Here is everything full of history and invites you to explore architecture, art and everyday life. Once the heart of the former East Berlin, Alexanderplatz is today the largest inner-city square in Germany and has developed into a popular shopping attraction. The view from the Television Tower, its height of 368 metres (1,207 ft) making it the tallest tower in Germany, is absolutely fantastic. A perfect 360° all-round view is provided by the revolving restaurant, which rotates at a rate of twice an hour. It’s Berlin’s most famous landmark and became the symbol of overcoming the division of Germany once the Berlin Wall came down. From an architectural perspective, the sandstone structure, built by Carl Gotthard Langhans, is one of the most magnificent examples of German classicism. Nowadays the Gate serves as a backdrop for festivals, big sporting events or New Year’s Eve parties. 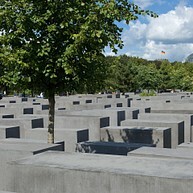 Not far from the Brandenburg Gate is located the Memorial for Europe’s Murdered Jews, a site of stelae (concrete slabs) arranged in a grid pattern on a sloping field accessible from all sides. It serves as a central place of remembrance and admonition and is supplemented by an underground information centre, containing the names of all known victims and details on the places of horror. There is no charge for admittance. An East German Trabant car, which appears to be breaking through the concrete. Honecker and Breschnew locked in a kiss of brotherly, socialistic love. With the East Side Gallery, a segment of the Berlin Wall has been turned into the longest open air gallery in the world. The Kunstmeile, or art mile in English, is located along the banks of the river Spree in Friedrichshain is 1316 metre long is also the longest segment of the Berlin Wall that is still standing. 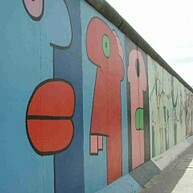 Right after the fall of the Berlin Wall, the East Side Gallery was painted by 118 artists from 21 dif-ferent countries. Using various artistic means, the artists commented on the political events that took place in 1989 and 1990 in over 100 works of art found on the eastern side of the wall. Many Berliners believe that the Gendarmenmarkt is the most beautiful place in Germany and indeed in all of Europe. Well, however that might be, it really is a must-see for all visitors to Berlin. This is the case because the Gendarmenmarkt is a beautiful example of an architectural ensemble full of harmony and it includes both the French and the German cathedral as well as the Concert House. 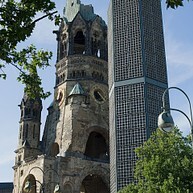 The protestant Kaiser Wilhelm Memorial Church is a memorial to peace and reconciliation. And it also stands for the will of the Berliners to rebuild their city during the period after the war. This is seen by the fact that the church not only consists of the ruins of the church which was destroyed during World War II but it also includes contemporary church architecture. It is thus a living contrast between modernism and history.